that indwells the human personality within the world of form. consist of appreciation, humility, valor, compassion, understanding, and forgiveness. lasers can perform functions that ordinary light cannot. coherent. Coherent, in this case, means linked in authenticity and genuineness. the Lyricus Teaching Order as the art of the genuine. or quantum primacy. This field is non-physical but informs the physical. stars, galaxies, and the universe at large. the local, the individual and the collective, the one and the infinite. blueprint of the physical heart. I wonder for what we know now that this is referring to the Quantum Presence? he did say the terms would change as we go and with that the programming of the HMS can't grasp it. In re-reading The Art of the Genuine, I was wondering if those born with heart defects could be the results of their subquantum UIS. My mother was born with a genetic heart defect, which worked as her blueprint. All her physical life was worked around that genetic heart. It was corrected after 47 years, after the heart pump was invented. When I take a good like at my life it was centered around her physical heart and the heart has been the center of my life all these years .Now it is center in the energetic heart instead of the physical heart. You, "I(U)S".....aka the DNA (aka the National Dyslexic Association).....aka First Source is perfect. .....perfection is a concept of wholeness misunderstood. A featherlight touch is all that is required to heal humanities wounds. Wounds are deeper then you realize Russel....is going to take a lot more .....at least at humanity level 3d.....as to more refined dimensions....another story.....but as always I appreciate your insight . wounds are self-inflicted ... perhaps they present challenges ... to one's self to overcome. Maybe they present challenges to others, that they need to overcome too- or experience unconditional love... whatever, it is an experience that many choose to have, and it seems to be something that many are choosing to experience in this life-time, when you consider how many millions are experiencing "dis-ease" now... perhaps to nudge Science in the direction of the Grand Portal ? While love serves a vital function in coalescing humanity and healing its self-inflicted wounds, it is the knowledge and rightful application of new sciences that will reveal the human soul to the mind of humanity. And it is this revelation that will bring humanity - as a collective species - into conscious alignment with the purpose of First Source. To move into the new insight, might I suggest the practice of the meditation in Lyricus Discourse 6-Steps 1-3 everyday for a month or more. This meditation is one that re-writes our emotional history. I always had the feeling that it was re-writing my from my beginnings of my adventure in my Human Instrument to the present. I have also felt that many of our issues really came from our separation from First Source, but we think it's the family, friends and co-workers. Thats just my thoughts, it may not be so for anyone else. I assure you Morkzarb ( ), I realise. Simply viewing one's immediate biological family provides ample evidence, but yes, humanity in 3d will eventually realise that the more refined dimensions (and senses), coupled with an open mind, enable each individual to rewrite, not just their emotional history, but history IT(s)Self. .....and darling.....oops, I mean Darlene ( ), thank you, as always, for sharing your thoughts. These "materials", certainly based on my experience, do indeed move one into A (A) clarity of "in(ner) sight" that manifest a finer perception of the outer view of one's local multiverse. It is, of course, very difficult to define.....then again MEST is the wilderness..... and it truly is a pleasure to be here on this mission with U.
Yep, this is very effective and I have been doing it since that discourse first came out. I like your thoughts Darlene. I love all of the discourses with their offerings and when done diligently, earnestly and consistently, watch so much fall away and see how clearly you can see if not be. These WMM provide more than enough suggestions and techniques to help us transcend any and all victimization and separation. It is important to reset your emotional state frequently in your day-to-day activities, and the art of the genuine is an excellent method to do so. It does not require that you practice the full visualization. Operating in your feeling world with an expanded understanding of how the heart virtues can be combined or sequenced for specific ife experiences is a fundamental shift in behavior that will serve you well. Why is practicing the art of the genuine a spiritual imperative? When you have found your own definitions of the heart virtues and you have assembled your insight into your behaviors, you will see that this is the key that unlocks the sheaths that surround your love frequency. There is no other vibrational identity within you that is more you than this pulse of divine love that defines your existence as a spiritual being. The goal is to invite this vibration–this being–into your human existence, and it will only emerge when there is harmony in your field of consciousness (i.e.,emotional state). Practicing the art of the genuine is a method to achieve this harmony and beckon your innermost self to join you in your human endeavors. It also helps to align the individual to the next phase of human evolution, which is directly concerned with the emotional state and its alignment to the spiritual impulse or love frequency. It is not that the mind is absent in this evolutionary leap, it is a vital instrument of the heart,but the intelligence of love supersedes the intelligence of the mind in the practical arena of human endeavor. In the human world, love is thought to be an action or feeling, not a form of high intelligence. The love of which I speak is the highest intelligence of the multiverse, but also the most misunderstood in the human domain. The human soul is a conduit of this love or intelligence, and First Source is releasing higher energetics of this love frequency in order for humanity to take the next evolutionary leap to the higher 4thdimension. This leap is facilitated if the individual is practicing the art of the genuine or something similar in nature because the new energetics are like wind to the sail if there is emotional coherence, and this “wind” will quicken you, in a sense, you will time travel to another You. Perhaps it has been said before, but I want to stress this point, do not practice the art of the genuine solely for your own spiritual growth. Practice it primarily for the evolutionary expansion of the planet and those whom your life touches. You are an engineer of this expansion and evolutionary movement when you operate from this perspective because you are focused on the locus of control–the functional leverage of your own emotional state for the good of the planet and those upon her. It is precisely this perspective that is the “sail” upon which the new energetics of First Source “blow”. 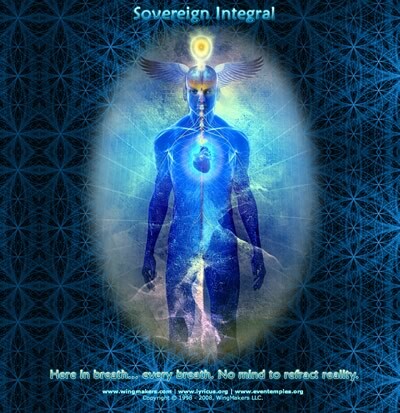 place in the universe, not necessarily because of what it represents today, but what it will represent in its glorious future.The love frequency that you hold inside you, the braiding of the six heart virtues into the formulas of loving behavior, can be channeled in such a way that it touches earth. Contemplate this: you can touch the earth with your field of consciousness in a powerful way that actually facilitates its evolutionary shift, and in so doing, your own as well. This is the final aspect of the art of the genuine that bears consideration. As your field of consciousness or energetic body becomes more harmonious and coherent, the love frequency seats itself more vibrantly in your human instrument. This means that you have access to your higher self in more vivid, tangible ways. With this heightened access, you also have the ability to channel this love frequency with selective precision. Channeling this love frequency to earth is an integral aspect of practicing the art of the genuine, but it is not to be tackled too early in the practice. There is a clearing of old patterns and energies that must take place first, and then a certain self mastery of the new energetics before one can channel with the required precision and emotional strength. It is a vital phase within the practice and could be likened to the final layer of its purpose. The power of the individual is contained in the fluid intelligence of their heart virtues. How one orchestrates their emotional state is reflective of their self-mastery. Equations of the heart virtues are the chain-link behaviors that enable one to move with grace through life’s myriad conditions and situations. The individual who understands the deeper meanings of their heart virtues and applies their equations in their life enrich their purpose on earth and gain access to the highest and most potent form of intelligence: divine love. This is perfect for this thread. It's by John Berges and posted in another thread by Darlene. Thanx Darlene! This is part of the speech that dealt with the 2012 shift. Another interesting detail about this paper (The Energetic Heart: Its Purpose in Human Destiny) is that it identifies 2012 as a time of dimensional shift for our entire planet. However, James and Lyricus do not describe this as an event that will occur when the Mayan calendar ends on December 21, 2012. The dimensional shift, which is more like a wave of energy that we are already experiencing. And like a wave it will gradually increase in size and power as it reaches its crest and makes its impact on our shores and then slowly subsides. The important part of this analogy is that this wave, like a tsunami, will be so powerful that it will transform the land that it crashes against. That “land” is our planet, and this wave will alter life here forever. Those individuals still rooted in materialism, fear, prejudice, and mistrust of others, will be severely challenged as their fear-based egos resist this shift to a more refined energy. In fact, I believe that this is already occurring. According to James, the most effective way to avoid the anxiety and fear engendered by this shift is to develop our connection to the energetic heart, which is a portal to the soul or Essence. This alignment with spirit is in line with the spiritual energies of the shift, and consequently its impact on our physical and psychological lives will be positive as we experience an expanded state of consciousness. However, before we celebrate our good fortune, it is important to point out that we will still be challenged just like the rest of humanity. So, at this critical time we must remain courageous, strong, and dedicated to our chosen spiritual paths. The art of the genuine is the practice of coherence between the deeper awakening of the heart virtues within each of us, and their faithful expression in the worlds of form. Those individuals who are awakened to the frequencies of the energetic heart within and practice . . . the expression of these frequencies in their behavior and actions are practicing their highest purpose. “The Art of the Genuine: A Spiritual Imperative,” p. 4. In other words, it is absolutely necessary for us to become Genuine Human Beings, by allowing the intelligence of the heart to flow into the hearts of everyone we meet. The Knowledge Book also teaches this. On page 67 of the English translation we find this statement: “For us, the Genuine Human Being is the one who will reflect his or her Divine Light on those around himself or herself without being lost in the problems of his or her depression.” This is a beautiful definition of selfless service. Applying these six virtues in our daily lives is a service we can perform that has the potential to transform ourselves as well as our relationships with others. The incoming energies of the shift are aligned to the spiritual power of Love, Brotherhood, and Unity. Therefore, those who remain in fear, prejudice, and separativeness will have difficulty adjusting to this new frequency due to the greater difference between the new energies and the old. This increased difference in frequencies can easily lead to intensified chaos and conflict in society. Therefore, these negative attitudes in the emotional dimension of our planet need to be transformed in order to reduce the negative effects of the dimensional shift on the general world population and increase the humanity’s sense of Unity. A critical factor in this shift is that it is also a consciousness shift. Therefore, the potential benefits of this energy shift are dependent on human beings such as us, who can express these intensified spiritual energies in our lives. In a very real way, each of us is an opening for these new energies to flow into the consciousness of humanity. Simply stated, when we transmit the virtues to others we are not only helping them as individuals, but also contributing to the well-being of the earth. Through the many centuries of human existence we have polluted the collective emotional field with fear, prejudice, and hatred. This has a feedback effect on all of us, including nature, for this accumulated negativity generates an emotional atmosphere that affects billions of people around the world.